Don't get me wrong: I like flowers and plants well enough. I just don't like taking care of them. 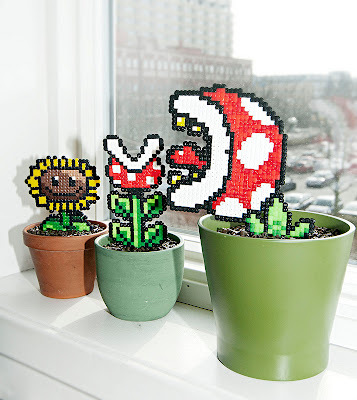 As such, I think Swedish artist Sandra Talving's "pixel plants," a number of which can be seen in the photo below, would be the perfect addition to our house or even our yard. Of course, I'd have to put them in the backyard if we went with the latter option, since you know some jerk would steal them on sight, but that's OK with me. I'd put them on our back deck, right below our kitchen window, so I could look at them as I wash dishes. Oh, who am I kidding? In reality, I'll salivate over them for a few minutes and then chicken out when it comes to buying one. Should you have more guts than I do, you may want to check out Talving's etsy shop at your earliest convenience. A bit too much, but I really like those too. Nothing's over the top for me. I would display them proudly.